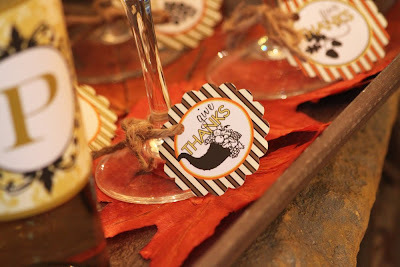 I'm so happy to unveil my new Amanda's Parties To Go Thanksgiving Printable Collection. So many clients love the children's party printables, but printable parties can be designed for all occasions -- ALL celebrations, including a family Thanksgiving dinner. For this collection, I wanted to design something sophisticated that could work for both traditional and more contemporary homes. The designs are full of damasks, stripes and geometrics in autumnal colors like pumpkin, olive, chocolate and gold. The Thanksgiving papers that I've included in the collection make this package extremely versatile. You can use them for everything from candle and jar wraps to favor tags and personalized Thanksgiving menus. 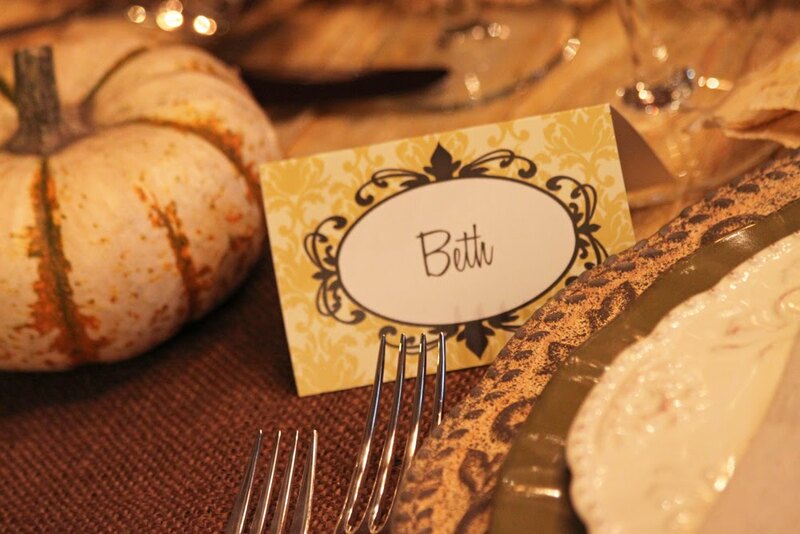 Over the next few days, I'll be posting more pictures and some ideas on table decorations and how to use your printables to create a warm, personalized Thanksgiving celebration. Posts will include a tutorial for a very unique and easy to make table runner, some gorgeous napkins and even a how-to on making your own Thanksgiving dinner menu. And lets not forget that Thanksgiving dessert table -- yum!! I'll be posting photos of that, too! 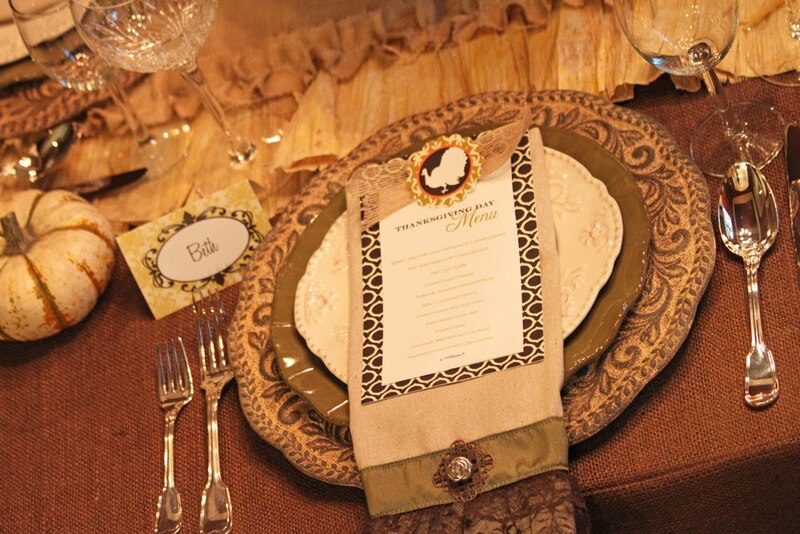 Create a stunning Thanksgiving place setting this year. Pull out all of your best dishes and silverware, wine glasses and candles -- only the best will do for this Thanksgiving feast! 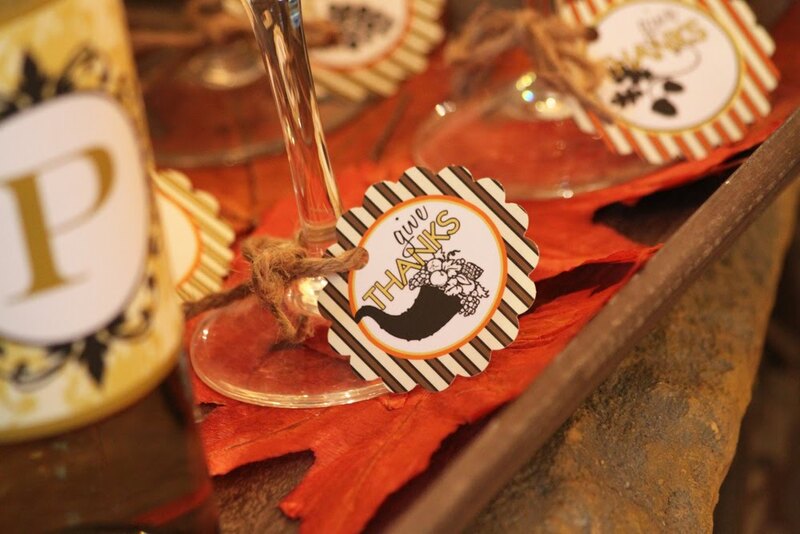 Personalize your dinner table with placecards and your own Thanksgiving menu made from one of the Thanksgiving Collection papers and a 2" logo. Buffet cards in 2 different designs are included in the collection. Use them as food labels for your buffet or even as placecards as I did above. These cards are fold over tent cards and can stand on their own. They come blank so that you can write in your menu items or guests names, but they can be personalized for a small additional charge. 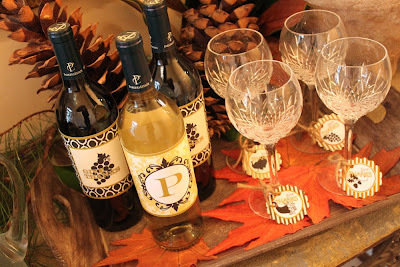 Printables can be used just about anywhere to add a little flair to your Thanksgiving decor. 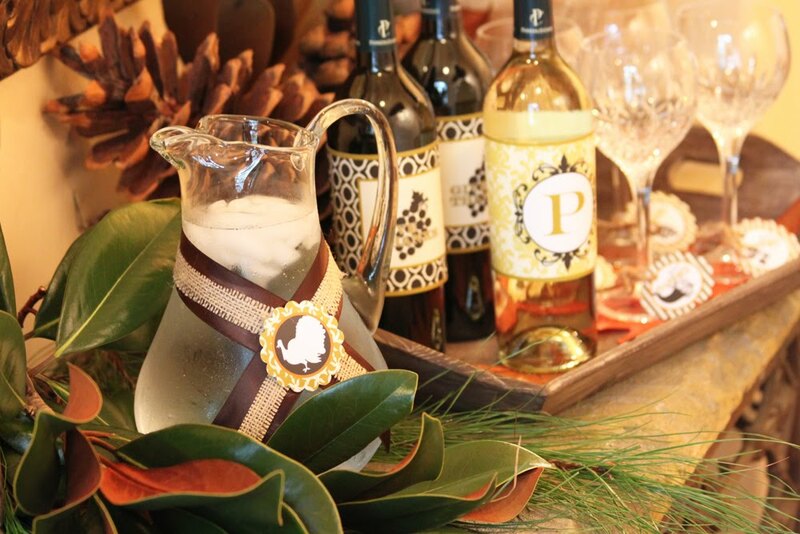 I used a little satin ribbon, a cut strip of burlap and a 2" Thanksgiving logo to spruce up this water pitcher. 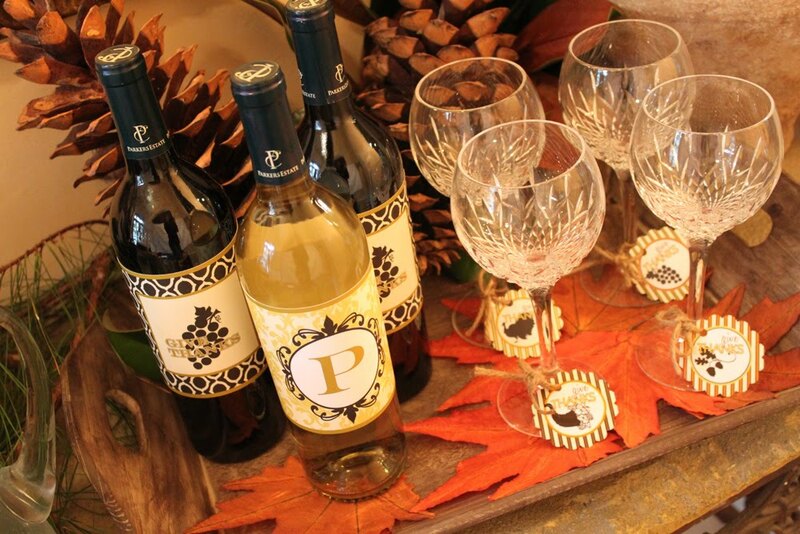 Beautiful wine bottle labels, one of which is personalized with your family's initial. Use one design for white wines and the other for reds. These 2" logos come in 12 different designs and can be used just about anywhere. Attach them to candy or other jars, use them for cupcake toppers, as gift tags or a sweet treat to send your guests home with. 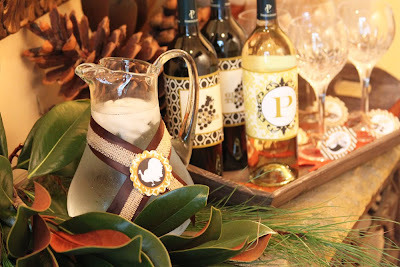 They can be combined with the Thanksgiving papers to create candle wraps, menus or use them as I have in the photo above as wine glass charms. Tomorrow I will share the entire Thanksgiving table so please check back for some wonderful inspiration. In the meantime, the Thanksgiving Collection is on sale for 40% OFF so grab your set today! I love it. It's really nice.